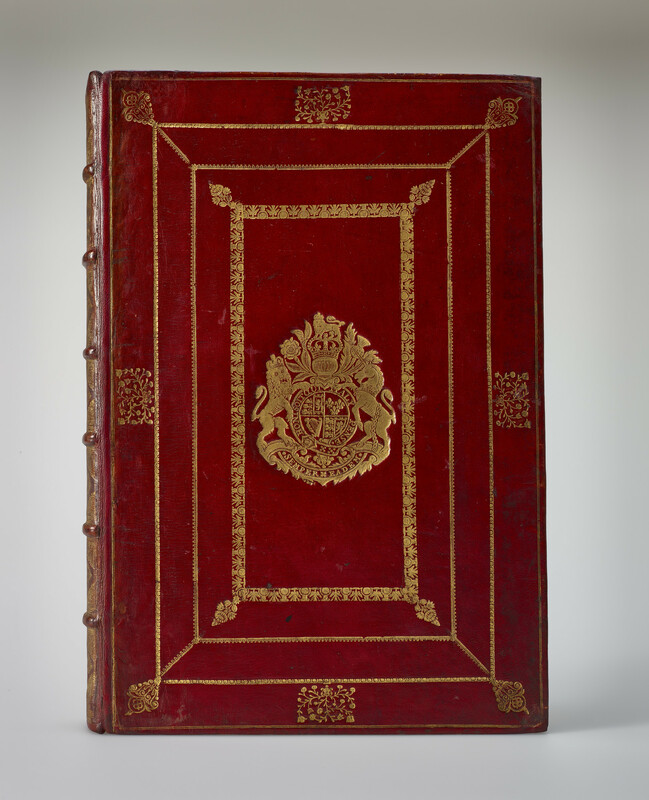 Bound in red calf, with coat of arms and motto of Queen Anne to centre, within panel design of roll of leaves and flowers in roundels, with floral lozenge-shaped tool to outer corners, within larger dogtooth roll panel, within larger frame of flowers in roundels roll, with vase of flowers tool to outer corners, and foliate stems in vase tool to top, bottom and sides. Spine divided into seven compartments with small tooling in each. John Flamsteed (1646-1719) was the first Astronomer Royal, and is noted for attempting to disassociate astronomy from the methods of natural science. This book is a copy of the controversial 1712 edition of his star catalogue, Historiae Coelestis. Flamsteed did not want the book to be published in this form. He believed that the discoveries he had made, he catalogued over 3000 newly discovered stars visible from Greenwich, ought to be verified by other astronomers before they were publicised. However, a Royal Society commission organised by Prince George of Denmark, consort of Queen Anne, was obliged to publish his findings. In 1711, Sir Isaac Newton and Edmond Halley received an unfinished copy of the findings which Halley proceeded to edit and publish, albeit with many inaccuracies, in 1712. Flamsteed was outraged, and in 1715, he received permission to acquire 300 unsold copies of the work, which he promptly burned. He continued to work on his own version of the star catalogue, and a multi-volume edition with a later, lavishly engraved, atlas was published posthumously by his wife between 1725 and 1729.